"I enjoy the impact engineering allows me to make on the world." 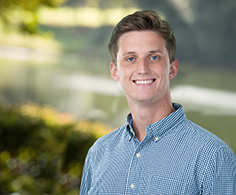 Eddie Lowry joined DELTA |v| as an Associate Engineer in 2018. Prior to DELTA |v| he held internships at both Leidos and Northrop Grumman in the Baltimore, Maryland region. After graduating with his BS in Mechanical Engineering from the University of South Carolina-Columbia, Eddie yearned to find a company that fulfilled two distinct desires. He wanted to be part of a company with a strong reputation for honesty and dedication to its craft. Further, he sought to actively use and build upon the skills he learned in the classroom. He checks both boxes with DELTA |v|, coupled with a newly-discovered fascination with forensic engineering. The more Eddie learns, the better. He is fascinated by the skills his fellow engineers use to process subtle clues—like a rogue tire mark or scrape—and how they use that information to understand the key details of an incident. He hopes to hone his own concentration and critical thinking abilities to become a major contributor to the DELTA |v| team. One of Eddie’s proudest achievements was being recognized as an Outstanding Christian Gentleman by his high school upon graduation. The award identifies a young man that exhibits compassion, hard work, and kindness to everyone he encounters. It’s a constant reminder to Eddie to always exemplify these traits throughout his life, both personally and professionally. And as a self-professed extrovert, Eddie is always eager to develop new relationships. He leverages positive energy to motivate everyone around him to do their very best. When he’s not honing his engineering skills, you’ll find Eddie enjoying the great outdoors, working out, or watching the South Carolina Gamecocks during football season.